•Converts 2 channels of speaker wire to 4 RCA outputs. •4 CHANNEL High to Low Compact Line Output Converter. 4 CHANNEL Hi-Low Converter. This line level converter / High-Low converter allows the user to run an RCA cable to an amplifier with a radio that only has speaker wire outputs. Each converter does 2 channels (2 speakers) The black wire is your ground wire. 2-Channel Hi-Low Line Output Converter. Line out converter. -Auto remote amp turn on. -Converts 2 channels of speaker wire to RCA outputs. -Compact design. 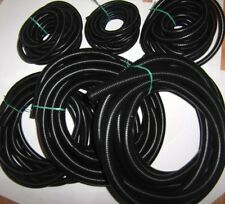 1/8" 1/4" 3/8" 1/2" 5/8" 3/4" and 1" Black Split Wire Loom Tubing 35 ft total (5 Ft of each Size). If you need 10 ft of each size order qty 2 and it will be one long 10 ft piece of each size, if you need 20 ft of each order qty 4. Hi to Low Adaptor. Speaker Wire. Gold Plated RCA Connections. 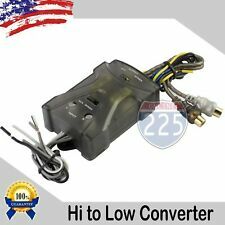 Hi/Low Line Out Converter. 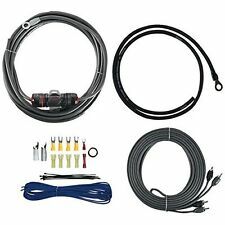 Car Audio Power Wire. Pricedrightsales was founded in Lincoln Nebraska in 2010 and has continued to grow in size providing great quality products at great prices. 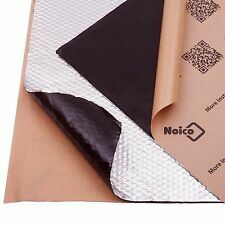 Acoustic speaker baffles. Pair of Speaker Baffles. 2 RCA female input and 2 RCA female output. Adjust the amplifier power level from your dashboard location. Less Noise and more bass. 2 RCA Inputs. 2 RCA Outputs. Gain -12dB to 0dB. Frequency 40HZ to 150HZ. Kicker KISLOC. Two channel Speaker to RCA. Split pin RCA with silver tinned OFC wire. Wire Harness. If you choose the wrong ones you may not get sufficient power to your system and can you leave your new speakers sounding worse than the old ones. SPEAKER WIRE TO RCA HI/LOW ADAPTER CONVERTER LINE OUT Features: --- line output hi/low adapter --- Converts speaker wire signal to dual audio RCA --- 5-wire design --- Dual channel --- Allows the user to run an RCA cable to an amplifier with a radio that only has speaker wire outputs Each converter does 2 channels (2 speakers) The black wire is your ground wire Can be used for either car audio or in home applications --- For use with car radios up to 50 watts Adapter converts speaker level outputs from head unit to low level for use with amps and equalizers with RCA type inputs. No adjustments needed on the unit itself, sends a signal so that you can use the gain control on your amp to adjust level. Square Twist Cup Connector. Round Spring Cup Connector. Push Spring Cup Connector. Push Spring Cup Connector Screw Holes. Plug Compatibility: Compatible with Banana Plugs. Need Assistance with Your Order?. 8" Cross flow Cooling Fan. •12V Cross-Flow Turbo Cooling Fan. •Puts out 92 cubic feet of air flow per minute. •Low profile & compact design for tight spaces. RCA GROUND LOOP NOISE ISOLATOR. Reduces most noise in your RCA signal path. Eliminates DC Current from your RCA cables. 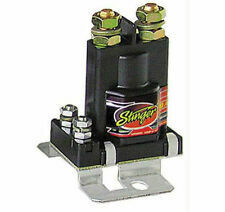 Eliminates ground loop noise from radio pre-amp outputs. The SNI-1 preamp noise filter plugs in between your receiver's preamp outputs and your amplifier. The ASWC programs itself to the the components it is being installed with. Automatically detects the vehicles OEM interface and will program itself to it. Car stereo requires a wired steering wheel remote input. 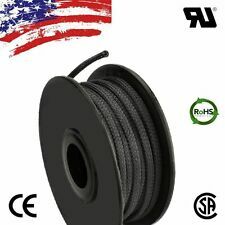 20 FT 1/2" BLACK SPLIT WIRE LOOM CABLE CONDUIT POLYETHYLENE TUBING. Quantity: 1/2" x 20 FT Polyethylene Cable Conduit. Split Loom Tubing Features High Quality, Durable Split Loom Tubing Perfect for Household Wires Cars. This Xscorpion LC014.4R is an adjustable high power line output converter, with an auto remote amp turn-on, which converts high level (speaker level) input into low level (RCA level) to be used after the head unit and before amplifiers or processors. 1/8" 1/4" 3/8" 1/2" Split Wire Loom Tubing Scrap Combo 30 ft total, you will receive at least 30 ft of scrap pieces. will be at least 8 ft of each size but more than 30 ft total. 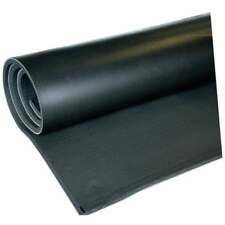 Description: 100% Brand New Size: 1/4" Inch Length: 100 Feet Color: Black Material: Mylar Very easy to bend Ultra expandable (150% of original size) Protects from wear & heat Gives an attractive look with a clean install Spool included Professional installation is highly recommended ( Instruction is not included )​ Package including: 100 Feet Expandable Tubing As the picture shown UPC Does not apply Brand Unbranded MPN Does Not Apply Condition New Warranty 90 Day. 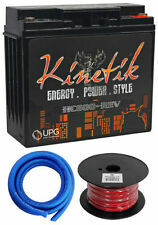 This is 100% maintenance free, pure power, sealed non-spillable car audio power cell! This battery will power up to a 1000 Watt powered audio system. This battery is equivalent to having over 100 one farad capacitors. Converts 2 channels of speaker wire to RCA outputs. -High to Low Compact Line Output Converter. Line Output Converter. Metra 81-6900 Universal Hard Plastic 6" x 9" Car Speaker Baffles (pair) 6x9"
Creates a tight, acoustic seal behind the speaker to enhance better sound quality. High grade Black ABS plastic construction. Very often there is more than one part available per application as auto makers often switch midyear. Item: 2 Channel line Output Converter with Remote Turn On for Radio or Amplifier Installations. High Power Line Out put converter. Signal sensing circuit for amplifier remote turn on. Designed to optimize audio levls between radio and amplifier to achieve best audio performance and avoid noise. 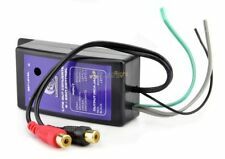 NEW CAR AUDIO RCA LINE-OUT CONVERTER W/ REMOTE TURN ON 2-Channel High to Low Converter with built in 12v remote turn on. Maintain factory radio and convert front or rear speaker outputs to RCA output. Features: Premium line output converter with remote turn-on Converts car speaker wires to pre-amp output Built in Remote turn on circuit For use with factory readios and aftermarket without rca High quality, durable construction Wiring diagram sticker included on bottom of unit These are a major time saver when installing an amplifier to a source without RCA's like a stock radio or aftermarket without RCA Jacks on it. 6.5" to 6.75" Speaker Spacer Mounts. These are perfect if your new speakers don't quite fit the the factory location or when you are installing speakers where there is no speaker already installed. With these speakers you will have an extra 1/2" which should be enough extra space for almost any set of speakers. For Select KICKER CX, CXA, PXA, PX, DX or DXA Series Amplifiers. FOR KICKER CXA/CX/PXA/PX/DX/DXA AMPLIFIERS. Surface Mount installation. Sorry no APO's, FPO's, Po Boxes, Alaska, Hawaii, Puerto Rico, or CODS. High Quality, Durable Split Loom Tubing Cable Conduit Perfect for Industrial, Automotive, Household, and Marine Applications. DNF Split Loom Tubing 1/4". For MORE of Our Split Loom Tubing in 1/2", 1/4", 3/8", 5/8" in 20 FT, 100 FT, and Combination Sizes! 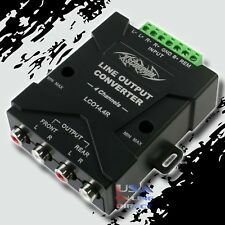 Line level converter / High-Low converter allows the user to run an RCA cable to an amplifier with a radio that only has speaker wire outputs, Inputs are adjustable as well! Each converter does 2 channels (2 speakers). 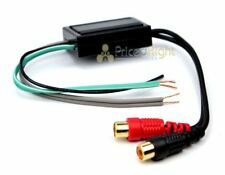 •Converts 2 channels of speaker wire to RCA outputs. •High to Low 2-Channel Line Output Converter. •Auto remote amp turn on. •Compact & lightweight design. High Quality, Durable Split Loom Tubing Cable Conduit Perfect for Industrial, Automotive, Household, and Marine Applications. DNF Split Loom Tubing 3/8". For MORE of Our Split Loom Tubing in 1/2", 1/4", 3/8", 5/8" in 20 FT, 100 FT, and Combination Sizes! 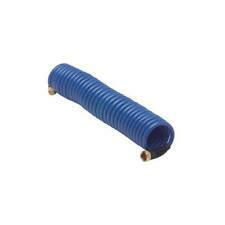 1/4" 3/8" and 1/2" Split Wire Loom Conduit 30 Ft. Polyethylene Tubing. (30) ft 1/4" 3/8" and 1/2" Split Wire Loom Tubing. (10 Ft of Each Size Loom). (10 Ft of Each Size). 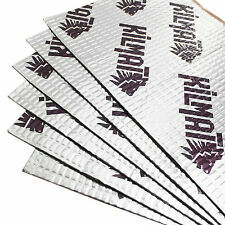 Best Prices on All Car Audio Installation Products. Install Bay Line Convertor. Connects the speaker level to RCA line level. Gold plated RCA connections. 4-Channel Line Output Converter. 4-Channel speaker level input for front and rear speakers. 4 Channel Fully Adjustable Output. BRAND NEW! NOT REFURB! FAST SHIPPING! 3 YEAR WARRANTY! Trending at $9.71eBay determines this price through a machine learned model of the product's sale prices within the last 90 days. Quantity: 1" x 20 FT Polyethylene Cable Conduit. 20 FT 1" BLACK SPLIT WIRE LOOM CABLECONDUIT POLYETHYLENE TUBING. Split Loom Tubing Features High Quality, Durable Split Loom TubingPerfect for Household Wires Cars. Speaker input in (high) - RCA output (low). 100 Ft. 1/2 " Split Wire Loom Conduit Polyethylene Tubing (2 Rolls of 50 Ft.). The split that runs along the whole length of the loom makes wire insertion easy and once the wire run is inserted, the split remains closed. 40 cubic ft. of airflow per minute. 1pc Relay harness. 1pc 40amp Relay. 12V Cross-Flow Turbo Cooling Fan. 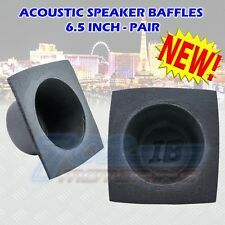 Universal Speaker Protector Baffle. Universal Speaker Protectors. Protect speakers from slamming door or trunk lids. General Features. 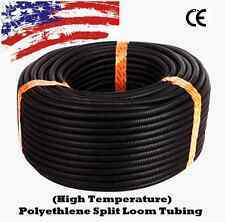 A/T 100 FT 1/4" SPLIT WIRE LOOM CABLE CONDUIT POLYETHYLENE TUBING 100 FEET 1/4"